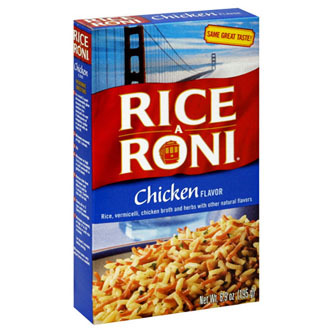 Chicken Rice-A-Roni creates a delicious side dish that is the perfect complement to your family’s chicken recipes. Blending rice, vermicelli, chicken broth, onions, parsley, garlic and other natural flavors to create a delicious burst of flavor. In a large skillet, combine rice-vermicelli mix and margarine or butter. Saute over medium heat until vermicelli is golden brown, stirring frequently. Slowly stir in water and special seasonings. Bring to a boil. Cover and reduce heat to low. Simmer 15-20 minutes or until rice is tender.